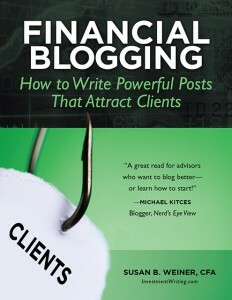 The virtual book tour for Financial Blogging: How to Write Powerful Posts That Attract Clients started on August 1, 2013. As my articles were posted around the blogosphere, I shared links here. Please visit! You’ll find links below. August 13: ClientWise—Is blogging right for you? You can also check out my “In the news” page, my blog, and Financial Blogging.